It’s frustrating when you step outside to rest and relax on your patio, only to discover that it’s covered in mildew. While it typically doesn’t cause any immediate health concerns, mildew can turn this otherwise attractive area of your home’s exterior into an eyesore. And if there’s a significant amount of mildew on the floor, it may pose a slip-and-fall hazard for you, your family members and anyone else using the patio. You can protect your patio from mildew, however, by following some simple steps. What Is Mildew? And Why Does It Grow on Patios? Mildew is a type of fungus that’s closely related to mold (also a fungus). It’s typically thin with a white or light green color. Because they are classified as a fungus, both mold and mildew need a few things to survive. This includes oxygen, organic matter and moisture. Without a readily available supply of these three elements, neither mold nor mildew will take hold on your patio. Mold- and mildew-causing fungi actually feast on organic matter. Whether it’s tree leaves, grass clippings, tree sap or even the wood, fungi will feast on organic matter as a source of food. Combined with accessibility to oxygen and moisture, mildew-causing fungi can easily thrive on your patio if certain precautions are not taken. You may discover that shaded areas of your patio are more susceptible to mildew than those exposed to the sun. The sun’s ultraviolet (UV) rays inhibit the growth of mold- and mildew-causing fungi. eHow explains that fungi doesn’t have the same photosynthesis properties as plants. While plants convert sunlight into food, fungi do not. Instead, they tend die from exposure to the UV rays. As a homeowner, you can use this to your advantage by embracing sunlight on your patio. 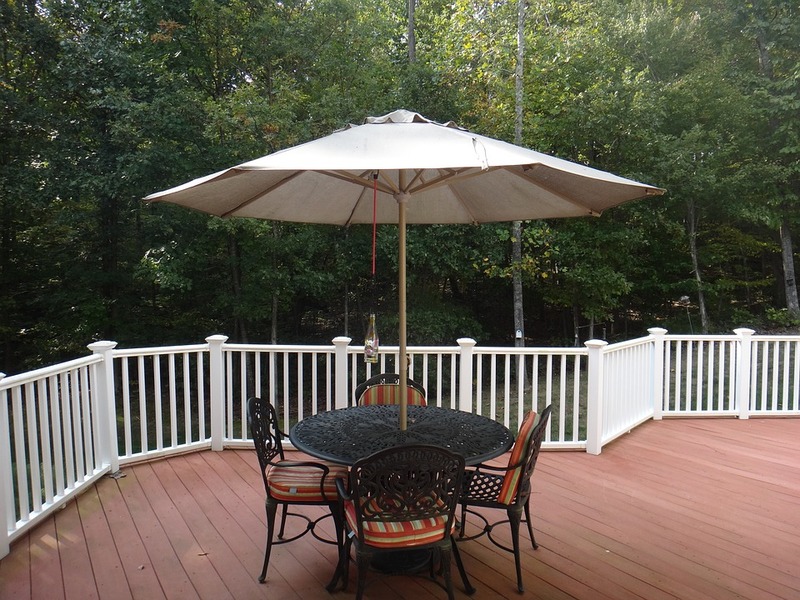 If you have a large table umbrella preventing sunlight from reaching your patio, take it down at the end of the day. The more sunlight that hits your patio, the better protected it will be from mold and mildew-causing fungi. Allowing debris to accumulate on your patio doesn’t just hurt your home’s curb appeal; it opens the doors to mold and mildew. All forms of fungus need organic matter to thrive. As a result, mildew often forms in areas where organic debris — tree leaves, branches, grass, etc. — have accumulated. To keep your patio free of mildew, you must clean this debris on a regular basis. The easiest way to clean debris off a patio is to use a leaf blower. If you don’t have access to a leaf blower, though, you can use a push broom. Just remember to get into the habit of cleaning your patio at least once a week to discourage the formation of mildew. It’s also important that your patio has proper drainage and runoff. In other words, water should flow away and off your patio rather than accumulating on it. As previously mentioned, mildew needs moisture to survive. If water pools up in the center or anywhere else on your patio, it will likely contribute to the formation of mildew. The good news is that most patios with a wood or composite deck are designed with many individual planks, each of which are separated with a few centimeters of space. When it rains, gravity will pull the water off the patio and through the cracks between these planks. There are times, however, when water may collect on a patio, resulting in the formation of mildew. The single most important thing you can do to protect your patio from mildew is to seal it. There are both wood sealers as well as brick sealers. Regardless of which material your patio floor is made of, you can use a sealer to create an invisible protective layer over it. Sealers work by creating a layer over the brick or wood floor. In doing so, mold- and mildew-causing fungi is unable to penetrate your patio floor. You can find sealer products available for sale at most home improvement stores. Certain types of patio furniture are more susceptible to mildew than others. Most untreated wood furniture, for example, carries a high risk of mildew because it contains organic matter that fungi can feast on. In comparison, plastic and synthetic furniture is naturally protected from mildew because it lacks organic matter. Alternatively, you can choose teak furniture for your patio. Although teak is a natural hardwood, it has special properties that protect it from mold and mildew. You see, the oils within teak deter insects and fungi alike, making it the ideal material for outdoor chairs, benches, tables and other patio furniture. Does your outdoor living space get flooded or washed out when it rains? It’s hard to enjoy this extension of your home when it doesn’t drain properly. The presence of standing water will damage your lawn, create mold and attract pests. In some cases, it can even jeopardize the structural integrity of your home. So, follow these steps to improve your landscape’s runoff and regain control of your outdoor living space. The first step to improving your landscape’s runoff is to clean the gutters. Consisting of metal or composite drainage channels, gutters are responsible for catching and guiding water safely away from your home. When it rains, any water that lands on your roof will flow to the gutters, down the downspouts and, hopefully, away from your home. If your gutters are clogged with leaves, dirt, branches and other debris, however, water will simply fall off the side of the roof. Clean your gutters at least once every six months to encourage better runoff and drainage. The way in which your downspouts are positioned will affect your landscape’s runoff. A good rule of the thumb is to include at least one downspout for every 30 feet of gutters. Assuming your roof runs 60 feet wide, that means you should have at least two downspouts on the front and back. These downspouts should be positioned at a slight pitch so that water flows rather than stagnates. It’s also important that you place downspout splash guards in the right position. Some homeowners assume that the widest end should be placed closest to their home. The correct way to position splash guards, however, is to place the narrowest end closest to your home. This allows water to flow freely down and out the catch basin. When positioning a catch basin with the widest end closest to your home, water will accumulate at the opposite end. Check all your downspout splash guards to ensure they are positioned properly. Aerating your lawn isn’t just good for the grass; it also improves runoff. As you may already know, aerating involves the use of a special tool that “scores” the soil by creating small holes that are a few inches deep. The primary purpose of aerating is to nourish grass with additional water and nutrients. As water fills the holes, grass is able to absorb it more easily. A secondary benefit, however, is its ability to control runoff. A significant amount of rainwater will run into the holes created through aerating instead of pooling up around your home or patio. Just remember to use caution after aerating your lawn and avoid walking over it. The soil be delicate for the next few days, so you want to avoid any pressure or stress that could otherwise disturb it. In addition to aerating your lawn, you should also reseed bare or dying patches. If there’s one or more areas of your yard where grass is missing, reseeding can help fill it in. Just remember to water and fertilize the area shortly after reseeding it. Thousands of homeowners from across the United States use rain gardens to improve their landscape’s aesthetics and control rainwater. What is a rain garden exactly? A rain garden is simply a collection of flowers or plants that’s used to catch rainwater. When it rains, some of the water will fall onto the plants and flowers, and some of the water will flow to the base of these plants and flowers. When it makes contact, water will absorb into the garden. Creating a rain garden is an excellent way to improve your landscape’s runoff while enhancing its aesthetics in the process. While concrete is the most popular material used to construct sidewalks and driveways, it’s not the only material. There are permeable materials that can absorb water and improve runoff. Known as permeable paving, it’s a porous material that’s highly useful for controlling rainwater. Some studies have even found that using permeable paving reduces pollutants and, subsequent, promotes a cleaner environment. When all else fails, consider building a French drain to improve your landscape’s runoff. Also known as a filter drain or sub-soil drain, it’s characterized by a relatively shallow trench that’s filled with gravel or pebbles. As rainwater flows into the trench, it’s guided away from the home. One of the great things about the French drain is its simplicity. Although you can create it with a pipe, the only thing it actually requires is a shallow trench with rocks on top. Rocks stabilize the soil while still allowing water to flow through. Using nothing more than a few bags of rocks from your local home improvement store and a shovel, you can build a French drain in your yard. Is your patio messy or otherwise cluttered? Unfortunately, this is an all-too-common problem experienced by homeowners. Once they begin using your patio, they allow clutter to accumulate. Before long, there’s garden hoses, tools, cushions and other items strewn across the deck. Not only does this affect the patio’s aesthetics, but it also affects its function. Clutter prevents homeowners, family members and their guests from using the space as intended. If this sounds familiar, consider the following storage solutions to de-clutter and improve your patio. Perhaps the best all-around storage solution for the patio is a deck box. Basically, this is a large rectangular-shaped box that’s designed specifically for outdoor storage. They are usually made of a heavy-duty waterproof material, allowing for the perfect patio storage solution. Using a deck box, you can store everything from gardening tools and fire pit accessories to seat cushions and decorative items. Best of all, they usually feature a stylish design that enhances the patio’s decor. How big is the deck box? Does the style match the rest of your patio decor? Taking these factors into account will help you choose the perfect deck box for your patio storage needs. With an average length of 25 to 100 feet (though sometimes longer), the garden hose is a major source of clutter on the patio. Sure, you can toss it on your lawn, but this doesn’t solve the problem, rather it moves the problem to a new area. Thankfully, there are several storage solutions available for garden hoses. One idea is to place it in a large tin bucket. Another idea is to mount hardware on the wall, allowing you to wrap up the hose and store it here. Additionally, you’ll find that many home improvement stores and gardening nurseries sell storage solutions for garden hoses. Some are retractable, consolidating the hose into a smaller size, and others are designed to conceal and hide the hose when not in use. Regardless of which one you choose, you need some type of storage solution for the garden hose. Of course, another idea is to use an outdoor storage ottoman. Like indoor “living room” ottomans, they typically feature a soft cushion on top — for sitting or propping up your feet — with a removable top and empty interior. From an outsider’s perspective, it looks like a regular piece of patio furniture. However, the top of an outdoor storage ottoman should either come off completely or fold up; thus, allowing you to store items inside. You’ll find that patio furniture sets are often sold with matching storage ottomans. So, if you’re looking to buy a new set of furniture for your patio, consider a set with a matching ottoman. This helps to balance your decor, creating a more cohesive appearance in which all of your furnishings flow together. But if you only want to buy a storage ottoman, look for a style that matches your existing patio furnishings. You can always invest in a separate storage shed for your patio. Because of the large size of storage sheds, however, you won’t be able to place them on your patio. Instead, you’ll have to place them in your yard or next to your home. Storage sheds have their own advantages and disadvantages. Some of the primary advantages include large storage space, protection from the rain and elements, and a stylish design. On the other hand, disadvantages include a high price and difficult/time-consuming to set up. If you’re willing to spend the money and invest the necessary time and energy into setting it up, however, a storage shed is a great way to de-clutter and improve the appearance of your patio. When storing items on your patio, don’t simply shove them underneath your furniture. Nine out of ten times, they’ll still be visible — and this doesn’t exactly reflect positively on your patio’s decor. For proper storage, items should be fully hidden and concealed from plain sight. You should also consider whether or not the item is suitable for patio storage. Even with a deck box or storage ottoman, certain items may damage when stored on a patio for long periods of time. Moisture from rain and humidity may soak inside items like cushions, causing them to develop mold and mildew. Therefore, you should only store water-resistant items on your patio. Seat cushions made of cotton or similar indoor materials, shouldn’t be stored on the patio. Now that summer is here, you’ll probably find yourself spending less time indoors and more time outside enjoying the warm weather and sunshine. For millions of men, women and children, summer is the preferred time of year. The comfortable climate allows you to host backyard parties and barbecues, as well as perform other activities. To enjoy your home’s patio or outdoor living space this summer, though, you should follow some basic maintenance tips. Take a few minutes to inspect your patio for pests this summer. Assuming it’s made of wood, an infestation may cause serious damage that’s difficult and expensive to repair. Some pests will bore holes into wooden structures, including your patio, so that they can build nests or eat the cellulose material. Either way, it damages your patio and can jeopardize its structural integrity. There’s nothing wrong with using a fire pit on your patio. On the contrary, it’s a great way to enhance the decor and functionality of this space. Once set up, you can use it to grill food, roast marshmallows or simply create a relaxing ambiance in the evening. However, it’s important that you keep your fire pit at least 10 feet away from your home and all other combustible surfaces. While rare, there have been cases of stray embers from a patio fire pit setting fire to homes. This problem is easily avoided by placing your fire pit at least 10 feet away from your home. Comfortable, attractive seating is essential to a modern patio. Without seating, neither you nor anyone else can fully enjoyable the patio and everything it has to offer. Rather than tossing up a half-dozen cheap plastic lawn chairs, though, consider using higher quality seating. Teak lounge chairs are always an excellent choice because of their unparalleled strength, durability, weather-resistant properties and style. Other seating options to consider for your patio include hammocks, benches, swings, stools and chaise lounge chairs. Just remember to strategically place them around your patio’s focal point. If you have a fire pit on your patio, this will be the focal point, so arrange your chairs and seating so that they face it. If any of your patio furniture contains fabric — either on the furniture itself or an attached cushion — don’t leave it exposed to the elements. When you are finished using the furniture, bring it indoors to protect it from damage. Although it seems harmless enough, allowing your furniture to sit outdoors exposed to the elements may degrade it. The combination of moisture, dirt and ultraviolet (UV) sunlight can wreak havoc on fabrics, causing them to wear and fade. By bringing your furniture indoors, you’ll make it last a little longer, allowing you to get more bang for your buck. Granted, not all fabrics are all susceptible to damage when left outdoors. Synthetic fabrics, such as polyester and nylon, typically don’t suffer from the same weather-related degradation as natural, organic fabrics. Unless your patio furniture is made of a weather-resistant synthetic fabric, though, you should bring it indoors to protect it from damage. Make sure your patio furniture is secure so that it won’t fall over or blow away during storms. Loose, lightweight furniture can easily topple during a sudden summer storm. And once the storm is over, you may be forced to search your yard and your neighbors’ yards for your missing furniture. There are a few ways to secure your furniture, one of which is to anchor it to the bottom of your patio using bungee cords or straps. Alternatively, you can choose heavier furniture, such as cast iron, instead of lightweight furniture. What’s wrong with leaving standing water on your patio? Standing water poses a few problems for homeowners. First, it attracts pests like mosquitoes. Female mosquitoes lay their eggs in water, with a single female laying up to 100 eggs every three days. Second, standing water encourages mold and mildew. Upon walking out on your patio, you may discover the planks are slick from mildew buildup. Finally, standing water contributes to rot and decay. If your patio doesn’t contain pressure-treated wood, or if it’s not treated with a waterproof finish, standing water may cause it to rot. Summer is the perfect time of year to pressure wash your patio. Going over your patio with a pressure washer will remove stubborn dirt and debris, making your patio look 10 years younger. And even if you don’t own one, you can rent a pressure washer from your local home improvement store. The beginning of fall marks the end of the warm summer weather. With this seasonal transition, you can expect cooler temperatures and shorter days. As a result, it’s important for homeowners to give their landscape a little TLC during this time of year. By following these 10 tips, you’ll create a cleaner and more attractive landscape that enhances your home’s curb appeal. Some homeowners assume that they can stop mowing their lawn during the fall. Although grass grows slower during this time of year than summer, you’ll still need to mow it. Mowing your lawn encourages a healthy, manicured landscape while keeping weeds and other unwanted, invasive plants in check. You should raise your mower blade so that it doesn’t stress your lawn. Depending on the particular grass species, a blade height of about 2 inches might be ideal for the summer. During the fall, however, 3 inches will give your lawn a little extra breathing room while minimizing stress. There’s no better time than the start of fall to test your soil’s pH level. If it’s too acidic or alkaline, grass, flowers and trees may struggle to grow. Using a disposable or reusable testing kit — available at most home improvement stores and gardening centers — you can measure the pH level of your soil. Healthy soil should have a pH reading of around 5.5 and 7.0. Depending on the number and variety of trees in your landscape, you may discover an excessive amount of leaves blanketing your lawn. Turning a blind eye to these leaves won’t make the problem go away. Rather, they’ll prevent your grass from receiving the sunlight and nutrients it needs to survive during this seasonal transition. To promote a healthy lawn during the fall, either rake or vacuum the leaves. You’ll need to winterize the flowers in your landscape so that they aren’t killed off by the cold fall weather. This involves pruning shoots and stems as well as adding mulch. The latter is particularly important because mulch acts as insulation. When added around the base of a flower, mulch traps in heat, thereby keeping the flower warm during this otherwise cool time of year. Of course, mulch also contains valuable nutrients that further promote healthy flower growth and development. So, add an extra layer of mulch in your flowerbeds to winterize and protect them from the cold weather. Spring isn’t the only time of year when you should fertilizer your lawn. It’s also a good idea to fertilize it during the fall. A high-NPK fertilizer — either synthetic or organic — will provide your grass with the right combination of nitrogen, phosphorus and calcium, as well as other “micro” nutrients, that it needs to grow and stay healthy. Fertilizer also encourages lawn grasses to rise earlier in the spring, which is another reason to apply it during the fall. Even healthy trees will suffer from dead branches. Rather than leaving dead branches on a tree, though, you should consider removing them. Assuming the tree is relatively low, you should be able to trim them using a ladder and gardening shears. Remove all dead, dying, diseased or injured branches from trees in your landscape. If your landscape includes perennials, trim these flowers during the fall to discourage pests. It’s not uncommon for plant-eating slugs to feast on perennials. And large perennials are more likely to experience pest infestations than smaller, more manicured perennials. You can encourage healthy growth for your perennials while minimizing the risk of pests by trimming them. Your lawn still needs water during the fall — just not as much as it does during the spring and summer when the temperatures are warm. Give your lawn at least one more watering of at least 1 inches during the fall. The water will soak into the soil, providing your grass, trees and plants with valuable moisture. Just use caution not to overwater your lawn, as the cool temperatures reduces water evaporation and can subsequently lead to soggy soil. If you have container plants on your patio, outdoor living space, garden or elsewhere, bring them indoors before the winter season arrives. Because they typically container smaller, more confined root systems, container plants are susceptible to injury from the cold fall weather. Thankfully, you can protect your container plants from shock and injury by bringing them indoors. If you have a climate-controlled basement, consider bringing them here for the fall and winter months. Once spring arrives next year, you can take your container plants back outside to further enhance your home’s landscape. Furniture is essential to your home’s outdoor living space. It creates a more functional area by providing you and your family with a place to rest, relax, cook, eat and enjoy the outdoors. But if your outdoor furniture has cushions, you’ll need to follow some basic steps to protect them from damage. When neglected, outdoor furniture cushions can fade, develop mold or otherwise become damage. To prevent from this from happening to your outdoor furniture cushions, consider the following tips. If you’re shopping for new outdoor furniture cushions, choose a fabric that’s resistant. Traditional fabrics like cotton and linen aren’t recommended because they absorb and hold a significant amount of moisture. If you leave cotton or linen furniture cushions outside, they’ll likely develop mold or mildew. Vinyl, olefin and textilene, on the other hand, are designed specifically to repel moisture, making the ideal for outdoor furniture cushions. Even if your outdoor furniture cushions are made of a water-resistant fabric like vinyl, olefin or textilene, you should still use a fabric sealant on them. Fabric sealants work by creating an invisible layer of protection over a fabric to protect against moisture, sun damage, insects, spilled liquids and more. They are typically sold in aerosol cans — like spray paint — that you spray over the surface of your furniture cushions. Along with choosing a water-resistant fabric, using a fabric sealant can protect your cushions from damage. Sun exposure won’t cause any serious damage to your outdoor furniture cushions, but it can cause discoloration due to fading. If your cushions are left under the direct sun, they’ll naturally fade to a lighter color. The sun’s ultraviolet (UV) light bleaches fabrics to create the appearance of a lighter, more faded tone. This isn’t something you’ll notice overnight, however. It can take several months for sun exposure to cause any noticeable change in the color you cushions. To prevent fading, try placing your furniture — with the cushions included — in a shaded area. The cushions will still receive some sunlight here, but it shouldn’t be enough to cause fading. Outdoor furniture cushions made of a water-resistant fabric can still develop mold and mildew when dirty. This occurs when mold- or mildew-causing fungi feast on the organic matter covering a dirty cushion. The dirt essentially acts as food for mold and mildew, allowing it to thrive. The good news is that you can easily clean your cushions. Assuming they are made of a water-resistant fabric, you can clean them using warm water and liquid laundry detergent. Just wet the cushions with soapy water, and scrub them with a clean washcloth. Try to get into the habit of cleaning your cushions at least once every one to two weeks to prevent the buildup of dirt. It’s not uncommon for insects and yard debris to end up on furniture cushions. A simple way to prevent this from happening to your cushions is to enclose your outdoor living space with a screen. Neither insects nor yard debris can enter a screened-in space. Not only does this preserve the original appearance of your furniture and cushions, but it also creates a more comfortable lounging space for you and your family. With a screened-in outdoor living space, you can enjoy the outdoors without worrying about common backyard pests like mosquitoes, flies and wasps. It’s important that you keep your outdoor furniture cushions dry. You might be wondering why this is necessary with water-resistant cushions. Well, water resistant isn’t the same as waterproof — and most cushions only feature the former type of fabric. As a result, they may succumb to damage when left outside and exposed to the elements. To make your cushions last a lifetime, you’ll need to keep them dry. Ideally, your cushions should be placed in an area where they won’t be rained on. And when they do get wet, use a clean towel to dry them. Keeping your cushions dry will prevent the moisture from saturating and damaging the fabric. When all else fails, you can always remove the cushions from your outdoor furniture and store them somewhere inside your home. Depending on the type of furniture, you may be able to detach the cushion. Chairs and benches, for example, often have Velcro cushions that you can easily remove. If your furniture features removable cushions, take them off and store them indoors when you are finished using your outdoor living space for the day. Alternatively, invest in a durable outdoor box or storage container for your furniture cushions. It’s not uncommon for furniture to fade outdoor furniture to fade over time. A table that was once midnight black may turn to a lighter, charcoal gray color. This typically doesn’t happen overnight. Rather, it takes months or years of exposure to the sun’s ultraviolet (UV) rays to cause any noticeable change in color. As a homeowner, though, seeing your outdoor furniture fade can be frustrating. You purchased your furniture with the assumption that it will retain its color, only to discover this isn’t the case. So, what can you do to protect your outdoor furniture from fading? Don’t try to cut corners with your outdoor living space by purchasing cheap, low-quality furniture. You may save a couple bucks, but there’s a greater risk of fading. A cheap plastic chair, for example, will probably fade more quickly than a high-quality teak wood chair. This is because manufactures use thin coats of paint on low-quality furniture to save money, thereby making them more susceptible to fading from sun exposure. High-quality furniture, on the other hand, is made with thicker coats of paints to achieve greater protection from the elements. Perhaps the most effective solution is to keep your outdoor furniture from fading is to apply a UV protectant product. These products live up to their namesake by protecting fabrics and surfaces from UV light, which is the catalyst of fading. Like sunscreen, it’s designed to reflect the sun’s UVA and UVB light. By blocking out these otherwise highly penetrating rays of light, UV protectant is able to keep your furniture from fading. You can use UV protectant on a wide variety of furniture types, including plastic, vinyl, rubber, fiberglass, wood and more. Furthermore, it’s easy to use, as mot UV protectant products come in a spray bottle. Just spray the product over the surface of your furniture, and it will remain protected from the sun’s UV rays. Keep in mind, however, that it’s effects will wear off. For maximum, long-lasting protection, it’s recommended that you reapply the UV protectant once every few months. Conventional wisdom should lead you to believe that placing your furniture in the shade will protect it from fading. If it’s not exposed to the sun, it won’t fade — not fast, at least. Your furniture will still receive some indirect sunlight, but it typically takes many years of exposure to indirect sunlight for outdoor furniture to fade. Therefore, you should consider placing your furniture in the shade. Assuming your patio or outdoor living space has a roof, place the furniture in an area that receives the least amount of direct sunlight. If it doesn’t have a roof, on the other hand, use a large patio umbrella or awning to create shade. By reducing the amount of direct sunlight your furniture receives, you’ll discourage fading and, subsequently, retain your furniture’s original color. It’s important that you clean your outdoor furniture on a regular basis. When left outdoors for a long period of time, furniture will attract dirt, pollen, dust, insects and other debris. As this debris accumulates on your furniture, it can wear down the fabric or outer layer of paint, thus increasing the risk of fading. The good news is that you easily clean most outdoor furniture by spraying it down with a garden hose. There’s no need for a pressure washing, as it typically does more harm than good by blasting away the outer layer. Instead, spray your furniture down with a garden hose every few months to keep it clean and protect it from fading. For outdoor furniture with fabric-based cushions, you can prevent fading by removing and bringing the cushions indoors when they aren’t being used. Most outdoor chairs, benches and other fabric-based furniture feature removable cushions. Bringing these cushions indoors will reduce their exposure to the sun and protect them from fading. The more you use your furniture, the less likely it is to fade. If you and your family sit in chairs, for example, those chairs will be protected from the sun. You can’t expect to use your outdoor furniture 24 hours a day, 7 days a week. Nonetheless, this can still help to protect your furniture from fading, especially when combined with the other tips listed here. What If My Furniture Has Already Faded? If you discover that your furniture has already faded, there are a few options to restore it. If it features a painted surface, you can repaint it with a fresh coat of the same color. Alternatively, if you faded furniture has cushions, consider replacing the cushions with new ones of the same type and color. Are you looking to design an outdoor living space for you and your family? Well, you aren’t alone. According to the AIA’s Home Design Trends Survey, it’s the single most popular “special function room” among homeowners in the United States. The survey found that consumer demand for outdoor living spaces increased by 38% from 2012 to 2017, attesting to its popularity. While an outdoor living space can open the doors to new activities and entertainment for you and your family, you should avoid making the following mistakes when designing it. If you intend to use your outdoor living space in the evening or at night, you need to design it with sufficient lighting. When the sun goes down, you should be able to illuminate this spaces so that you and your family members can use it. There are countless lighting solutions available for outdoor living spaces, including string lights, solar lamps (they work at night), pendant lights, sconce and traditional overhead fixtures. To save money on power, choose a lighting solution that uses an energy-efficient bulb like compact fluorescent lighting (CFL) or light-emitting diode (LED). CFL and LED use a fraction of the energy of conventional incandescent bulbs, making them a smart investment for your outdoor living space. It’s important that you use a cohesive decor when designing your outdoor living space. Some homeowners make the mistake of using a half-dozen colors and multiple decor styles, only to create an eclectic eclectic design that hurts their home’s curb appeal. Stick with a single color scheme and design style to create an attractive, lively environment that reflects positively upon your home’s aesthetics. There’s nothing wrong with installing appliances in your home’s outdoor living space, but they need to be water resistant. Even if the area is covered with a roof or awning, your appliances will still be susceptible to moisture damage from humidity exposure. It may not happen immediately, but constant exposure to high humidity will eventually damage these outdoor appliances. A simple solution, however, is to choose water-resistant appliances that are specifically designed for outdoor use. Whether it’s a refrigerator, stove, grill or even a TV, it must be designed for outdoor use. What’s the most important element for an outdoor living space? According to a survey cited by Kleber and Associates, that accolade goes to a fire pit. Unfortunately, many homeowners overlook this feature when designing their outdoor living space. Instead, they use a traditional charcoal or propane grill. Just because your outdoor living space features a grill, though, there’s no rule stating that it can’t have a fire pit. In fact, adding a fire pit will create a more attractive, entertaining area. You can use it to set a relaxing ambiance for nighttime parties, ward away mosquitoes, roast marshmallows and more. The bottom line is that all outdoor living spaces should feature a fire pit. When choosing seating for your outdoor living space, consider both aesthetics and function. Even if a chair or bench is attractive and flows cohesively with the rest of your space, it might be comfortable to use. And without comfortable seating, you probably won’t use your outdoor living space very often. There’s no one-size-fits-all solution for an outdoor living space. Rather, you should design it according to your own needs. If you plan on hosting large outdoor parties with all your friends, family and neighbors, you should design it large to accommodate these people. But if you live by yourself, you should design it small. An appropriate size will help you get the most use out of your outdoor living space while minimizing maintenance and upkeep requirements. Your outdoor living space needs to be easily accessible. In other words, neither you nor anyone else should be forced to walk a long ways — or through difficult terrain — to reach it. This is why many homeowners create their outdoor living space on their patio or back deck. You can still create it farther away from your home, but it’s recommended that you use pavers or stones to form a walking path. Don’t forget to consider the direction of the sun when designing your outdoor living space. If the sun beams directly down on your outdoor living space, you may find it unbearable to use during the “dog days” of summer. Of course, there are ways to overcome this challenge. You can build a roof or install an awning, for instance, to create shade. Another idea is to install a misting system that sprays a cool water mist over your outdoor living space. A patio is an invaluable upgrade to your home that extends its living space to the outdoors. You can use it to host backyard barbecues, parties or just lounge under the sun. But if you’re thinking about building a patio, there are a several things you must consider. Where exactly do you want the patio? Most homeowners choose to build a patio either on the front or rear of their home. When choosing between these two locations, consider privacy. Building a patio on the rear of your home will likely provide you and your family with greater privacy. The downside, however, is that it won’t have the same positive impact on your home’s curb appeal. it’s also important that you consider the size of your patio. A larger patio will provide you and your family with more space, but it also requires more materials and resources to build. According to The Concrete Network, the average size of a patio in the United States is about 16 feet by 18 feet. This is an appropriate size that allows for a pleasant outdoor living space without requiring a substantial amount of materials and resources to build. Building a raised patio requires more work than building a ground level patio. You must include the appropriate supporting structures, and ensure that the foundation is solid and not vulnerable to erosion. Otherwise, you may find yourself with a sinking patio in the near future. While optional, many homeowners also install stairs on their raised patio so that they can access their yard. A ground-level patio is undoubtedly easier to build for these reasons, but you may or may not have this option depending on your property’s layout. Of course, you should consider the materials used in your patio’s construction. Most patios are constructed with either wood or concrete (or both). Concrete is an excellent choice for ground-level patios because of its superior strength, longevity and ease of use. Wood, on the other hand, is preferred for raised patios, as it’s lighter and more structurally sound. You can also stone and brick for ground-level patios, both of which offer similar benefits as concrete. A can improve the functionality and aesthetics of your patio in several ways. First, it creates a more comfortable space for you and your family by casting shade. A roof will keep the sun out of your eyes, allowing you to enjoy your patio just a little more. Second, it will protect your patio furniture from sun and moisture damage. Without a roof, furniture will be exposed to the elements, resulting in faster degradation. Third, a roof enhances the appearance of your patio, and home, by adding a new design element. So, if you’re willing to make the investment, add a roof to your patio. How much maintenance will your patio require? It’s difficult, if not impossible, to determine exactly how much work is required to maintain a patio until it’s constructed. At minimum, you’ll need to clean your patio’s surface on a regular basis. This can be done by scrubbing it or by using a power washer. For wooden patios, you may also need to inspect the fasteners — nails, screws, anchors, etc. — to ensure they are secure. When fasteners begin to work their way out, you must drive them back in place to preserve the structural integrity of your patio. Consider the location of utilities like underground electricity, water, plumbing and gas lines when building your patio. Never perform any construction that requires digging into the ground without first identifying the location of all underground utilities. If you aren’t sure where these lines are located, contact your utility providers. Alternatively, hire a contractor to build your patio. You won’t be able to fully enjoy your patio at night unless there’s adequate lighting. Therefore, you should consider lighting when building your patio. Just a single high-lumen fixture should suffice for most average-sized patios. Of course, you can install other lighting solutions like string lights, solar lamps or tiki torches as well. It’s always a good idea to check your city or county building codes before constructing a new patio. Many municipalities have strict laws regarding residential construction, and failure to comply with these laws could result in a fine and forced removal of your patio. Finally, consider the type of furniture that you want to use on your new patio. At minimum, you should include chairs or other forms of seating on your patio. Additionally, however, you may want to include a fire pit. With a fire pit, you can cook foods, roast marshmallows and create a warm, comfortable environment on your patio during the otherwise cold winter months. As the weather continues to warm, you’ll probably find yourself spending more time outside. A properly designed patio with comfortable seating and a fire pit is the perfect area to enjoy the warm and sunny summer weather — but only if it’s free of pests. Unfortunately, pests are a common occurrence on patios. From mosquitoes to termites and bees, these pests can wreak havoc by inflecting pain or causing structural damage. Here are a few of the most common patio pests and how to prevent them. It’s difficult to enjoy your patio when you’re being constantly bombarded by blood-sucking mosquitoes. Normally, mosquitoes are only problem if there’s standing water on or near your patio. Female mosquitoes lay about 100 eggs in water every third night after they mate. By eliminating areas of standing water around your home, you’ll discourage mosquitoes from reproducing and create a more harmonious outdoor living space. If you own a cat, dog or both, you may notice fleas on your patio. Research shows that a single female flea can produce 600 eggs per month. Like mosquitoes, fleas feast on blood, though they generally prefer the blood of small animals rather than humans. Therefore, eliminating them from your patio requires treating your pets. Talk to your veterinarian about a flea treatment regimen for your cat or dog. He or she should be able to recommend an effective flea prevention and treatment product, such as Fipronil. Additionally, applying a layer of cedar mulch across your lawn can deter fleas and other common pests. Cedar contains a combination of unique oils that, for whenever reason, fleas hate. By adding it to your lawn, you’ll discourage fleas from taking refuge. If your patio is constructed of wood, you should inspect it for signs of termite damage on a regular basis. These wood-boring pests cause billions of dollars in property damage to houses each year in the United States. The most effective way to prevent termites on a patio is to use pressure-treated lumber. As you may know, pressure-treated lumber is sprayed and treated with chemicals to protect it from pests, rot and decay. You can expect to pay more pressure-treated lumber than non-pressure-treated lumber, but it’s a smart long-term investment because of the increased protection that it offers. The Environmental Protection Agency (EPA) also offers some helpful tips to protect against termites, some of which include filling cracks in the foundation, storing firewood off the ground (don’t store it directly on your patio), finding and fixing water leaks and ensuring your lawn has proper drainage. And if you discover termite damage on your patio, have it repaired as soon as possible to mitigate the damage. Normally, bees and wasps will keep their distance from humans unless provoked, but there’s one common exception: the yellow jacket. Classified as a wasp, these aggressive pests may seek out and sting nearby people unprovoked. It’s important to note that yellow jackets feed on protein, so keeping them off your patio requires removal of protein sources. If you grill burgers or cook other food on your patio, be sure to bring it indoors when you are finished. Leaving protein sources on your patio will only attract yellow jackets and other pests. Yellow jackets are also attracted sugar. Whether it’s a watermelon rind, cup of sweet tea or plate of leftover dessert, you should avoid leaving sugary foods or beverages on your patio. And then there are flies. The good news about flies is that most species have an average lifespan of just one month. The bad news, however, is during that time a fly can lay up to 500 eggs, so you need to take action to keep them off your patio. A simple solution to keep flies, mosquitoes and other flying pests away from your patio is to build a fire. The smoke from a fire is a natural insect repellent and will deter most flying pests. You can also keep flies away from your patio by using a fan. Assuming your patio has an overhead fan built in, turning it on will literally blow away the flies so that they can take over patio. Does your home have an outdoor living space? If not, you should consider creating one. Whether it’s a patio, porch, garden or even an area of your lawn, an outdoor living space will open the doors to new opportunities for you and your family. Of course, some homeowners believe they aren’t worth the time and energy to create. While setting up an outdoor living space certainly requires work, it can pay off in the following ways. With an outdoor living space, you can host parties with friends, family members and neighbors. Just set up some chairs around a fire pit, and you’ve got the perfect space for a party. You can even host parties year-round by installing a patio heater. These outdoor heaters are designed to warm the surrounding space, typically using propane or gas. Even when the otherwise cold fall or winter weather arrives, you still host outdoor parties using a patio heater such as this. An outdoor living space also promotes health and wellness. Statistics show that up to three-quarters of Americans suffer from vitamin D deficiency. Known as the sunshine vitamin, vitamin D is essential because it allows our bodies to absorb calcium and build stronger bones (among other things). Although certain foods contain vitamin D — salmon, beef liver, cheese, eggs, etc. — the easiest way to get vitamin D is to lounge outdoors under the sun. Spending just 20 minutes under the midday sun will trigger your body to produce the recommended daily intake of vitamin D.
A lesser-known benefit of outdoor living spaces is increased property value. Prospective home buyers today pay close attention to a home’s exterior. If it’s poorly designed and lacks an outdoor living space, they may choose a different home to purchase. As a result, adding an outdoor living space can increase your home’s property value. The key thing to remember, however, is that you need to create an appealing, functional space that’s easy to maintain. Installing a swimming pool may sound like a good idea, but the labor and costs of maintaining a pool may deter some buyers. So, design your outdoor living space with aesthetically pleasing, functional elements while ensuring that it’s easy to maintain. Otherwise, it won’t have a positive impact on your home’s property value. You can increase your home’s curb appeal by creating an outdoor living space. Some homeowners assume that their lawn defines their home’s curb appeal, but this isn’t necessarily true. Although it plays a role in curb appeal, the overall design of your home’s exterior — including the presence of an outdoor living space — will ultimately define its curb appeal. To take advantage of this benefit, though, you should design your outdoor living space with a cohesive theme. In other words, don’t use colors or design elements that clash with one another and, instead, stick with a central design theme. You have to think of an outdoor living space as a financial investment. You’ll have to pay for furniture and accessories, but it can save you money in the long run. Once your outdoor living space it set up, you and your family can use it instead of driving to the local park and performing other paid activities. Over the course of a year, or several years, the cost-savings benefits of an outdoor living space really add up. Tired of cooking in the kitchen? With an outdoor living space, you can grill and smoke foods outside. There are several different outdoor cooking accessories that you can use for this purpose, including a grill (propane or charcoal), fire pit or even a complete outdoor kitchen. Of those options, however, a fire pit is arguably the most versatile. You can use a fire pit for grilling or smoking, and you can even experiment with different types of charcoal and/or wood chips. It’s hard to enjoy the outdoors when the midday sun is glaring down on you. Depending on the angle, it may create a glaring, blinding light. Thankfully, an outdoor living space with shade can protect you from this phenomenon. You can install an awning over your outdoor living space, for instance, to create shade. Alternatively, you can set up a table with a patio umbrella. These are just a few ways to turn your home’s outdoor living space into a shaded, comfortable oasis for you and your family to enjoy. Furthermore, an outdoor living space is relatively easy to set up. Even if you have little or no experience with do-it-yourself home renovation projects, you can still create an outdoor living space. All it takes is some chairs, a fire pit and a few decorative accessories. If you have a concrete driveway or sidewalk, you should take a few basic precautions to protect it from cracking. When properly installed, concrete typically lasts for decades, offering you and your family countless years of use. There are times, however, when it may develop hairline fractures or cracks. And when left unchecked, these otherwise small cracks can develop into larger cracks that jeopardize the structure integrity of the driveway or sidewalk. So, if you have a concrete driveway or sidewalk, you should familiarize yourself with the following tips to protect it from cracking. First, it’s important to understand what causes concrete driveways and sidewalks to crack. While cracking can occur from any number of issues, one of the most common causes is an improper ratio of water to concrete. When too much water is added, the moisture will evaporate as the concrete sits, causing to shrink and, eventually, crack. It’s not uncommon for concrete slabs to shrink by as much as 0.5 inches per 100 feet. Therefore, it’s important that homeowners, builders and general contractors alike use the proper mixture of concrete and water. In addition to using an appropriate ratio of water to concrete, you should also grade and compact the soil when installing a concrete driveway or sidewalk. When concrete is poured on uneven or loose soil, it increases the risk of cracking. Over time, the soil will shift and place stress on the concrete. As this stress increases, it can literally pull apart the concrete, leaving large cracks or fractures behind. By properly grading and compacting the soil, however, you can prevent this from happening. Again, this is why it’s important that all homeowners, builders and general contractors invest the necessary time and energy to prepare for proper installation. Once you’ve installed concrete, you should use a sealant product to protect it from moisture. Freeze-thaw damage often creates cracks in concrete sidewalks and driveways. This phenomenology occurs when water seeps into the porous holes of the concrete and turns into ice. This creates pressure that loosens the concrete, causing it to crack. A simple solution to protect concrete from freeze-thaw damage is to use a sealer. Available at most home improvement stores, a sealer will create an invisible waterproof barrier over your concrete, protecting it from the intrusion of moisture and subsequent cracks that may develop from the freeze-thaw cycle. Penetrating Sealer: As the name suggests, penetrating sealers are designed to penetrate deep into concrete to create a superior level of protection from moisture and debris. They are often preferred in harsh environments where there’s a high risk of damage. Penetrating sealers are an excellent choice for protecting your concrete driveway or sidewalk from freeze-thaw damage. Decorative Sealer: Available in a wide variety of sheens and tones, decorative sealers offer an exceptional level aesthetics when compared to other concrete sealant products. They also dry and set more quickly than other sealers. The downside to decorative sealers, however, is that the lack the protection offered by penetrating sealers. Therefore, they should only be used in applications where there’s low risk of cracking of structural damage to the concrete. Durable Sealer: The third type of concrete sealer, durable sealer, offers a longer lifespan the aforementioned types. It’s designed to create a strong, long-lasting barrier of protection over the concrete. Durable sealers are also available in a variety of sheens and tones, and they are usually resistant to the sun’s ultraviolet (UV) rays. While there’s no substitution for a high-quality sealant, you can further protect your concrete driveway or sidewalk from cracking by ensuring the surrounding landscape has proper drainage. Poor drainage is a common cause of cracking in concrete. When water collects on or around a concrete driveway or sidewalk, the excess moisture will seep under the concrete, causing the land to shift, thus stressing the concrete. This usually doesn’t happen overnight, but rather it takes months or even years for cracks to develop. You can reduce the risk of cracking in your concrete driveway or sidewalk by ensuring it has proper drainage. Check your downspouts to ensure they are directed away from your home and towards a nearby storm drain. And the next time it rains, pay attention to your landscape to see where the water flows. If it’s pooling up in certain areas, you need a new drainage solution to keep the moisture away from your driveway or sidewalk. Water is usually good for lawns. Whether your lawn has fescue, bluegrass, ryegrass, bentgrass, St. Augustine, Scutch grass, crowngrass or any other common variety, it needs water to survive. Your lawn might be able to go a couple weeks without water, but it will gradually turn brown and die shortly thereafter. With that said, too much water — combined with poor drainage and runoff — may cause waterlogging. When this occurs, water collects at the top of the lawn rather than flowing away. Aside from its unattractive appearance, a waterlogged lawn presents several challenges for homeowners. When the soil remains saturated over a long period of time, grass roots will literally rot. Known as “root rot,” for obvious reasons, it’s the beginning of a slow death for your lawn. Furthermore, a waterlogged lawn contributes to fungal disease, which is another key problem. And depending on where you live, you may find a higher number of pests like mosquitoes and gnats when your lawn is saturated with water. So, what can you do to prevent this from happening to your lawn? First, check the downspouts to ensure they are directed away from your house. If possible, connect the end of your downspouts with tubing that runs to a nearby creek or drainage ditch instead of the base of your home. If your lawn isn’t properly graded (e.g. angled away from your home), water will collect on the surface and contribute to waterlogging. By guiding downspouts away from your home, you’ll protect your lawn from excessive runoff. Of course, you should also use this opportunity to check the gutters attached to the downspouts. If there are trees growing next to your home, there’s a good chance your gutters will fill with leaves and debris. Over time, this debris will restrict the flow of water, causing it to pool up and flow off the sides instead of down through the gutters and downspouts. You can prevent this from happening by cleaning your gutters on a regular basis. Using a ladder, carefully climb and access to the top of your gutters, removing any leaves, limbs or other debris. When you are finished, flush them with a garden hose. Aerating the soil can help protect your lawn from becoming waterlogged. Waterlogging often occurs when the soil is too compact for moisture to drain properly. Normally, water will soak into the soil. When the soil is compacted, however, it sits at the top and contributes to waterlogging. A simple solution is to aerate your soil, which involves scoring your landscape with many small holes. Not only will this prevent moisture problems, but it also encourages nutrient penetration, thus promoting a lush-green, healthy lawn. Reseeding your lawn can reduce the risk of waterlogging. Grass acts as a natural barrier against erosion. When there are bare patches of missing grass on a lawn, rainwater may erode the soil and contribute to waterlogging. Thankfully, you can prevent this from happening by reseeding your lawn. Wait until you’ve aerated the soil, after which you can spread a mixture of grass seed and fertilizer. When the grass grows in, it should reduce or potentially eliminate drainage problems with your lawn. If your lawn has severe drainage issues, consider digging a French drain. As explained by The Spruce, this otherwise simple drain consists of a buried pipe with gravel on top. When water lands on the gravel, it soaks through and into the pipe, at which point it’s carried away from the lawn. A French drain is a simple yet effective solution for waterlogging. Aside from a few bags of gravel, some plastic tubing and a shovel, it really doesn’t require anything else to build. Adding a top dressing to your lawn can protect it from drainage problems. Top dressing is essentially sand, leaves, mulch or soil that’s placed over the surface of the lawn. It offers a variety of benefits, including supplying your grass with additional nutrients, discouraging weed growth and preventing drainage problems. Simply add a 1/2-inch layer to the top, ensuring that the grass is still visible (the top dressing shouldn’t cover the grass completely). #7) Don’t Walk on Your Waterlogged Lawn! Finally, try to avoid walking on your lawn when it’s waterlogged. When grass is waterlogged, it’s susceptible to stress and damage. Even minor pressure like your foot pressing against the surface may damage or kill it. So, wait until your lawn has fully dried out before walking on it. If necessary, walk around the waterlogged portion of your lawn when entering and exiting your home. By following these tips, you’ll be on your way to healthier, drier lawn. Spring is in the air, which means the temperatures will become warmer and the days longer. This seasonal transitional offers the perfect opportunity for homeowners to touch up their landscape and enhance their home’s curb appeal. Doing so will not only improve the appearance of your landscape but will also make it more functional, allowing you and your family members to enjoy this outdoor extension of your home. Here are a few tips to enhance your landscape this spring season. There’s no better time than the beginning of spring to aerate your lawn. As you may already know, aeration involves perforating the top inch or so of soil with small holes so that nutrients and water can pass through more easily. When soil hardens during the winter, it prevents water and nutrients from flowing, thus restricting the growth and health of your grass. By aerating, you’ll promote a healthy, lush-green lawn. Whether it’s dandelions, crabgrass, bindweed, chickweed, bluegrass, etc., you should knock out any weeds attempting to grow on your lawn. During the transition from winter to spring, weeds — like grass and plants — will emerge from their state of dormancy. And if left unchecked, they can quickly take over your lawn while consuming valuable nutrients that could otherwise be used by your grass. Rather than using a store-bought herbicide, though, consider making your own DIY weed killer. It’s actually pretty easy and highly effective when done right. Simply fill a spray bottle with distilled white vinegar and add 1 or 2 tablespoons of liquid dish soap. Shake thoroughly to ensure the ingredients are mixed together, after which you can spot treat any weeds you discover on your lawn. Add a layer of mulch to your flowerbeds to keep the area weed free. Mulch is designed to block out the sun so that weeds and grass can’t grow in areas where they shouldn’t (like flowerbeds). Additionally, some mulch contains valuable nutrients that will stimulate plant growth, allowing flowers to bloom more easily during spring. Tip: even with mulch, you may discover weeds growing in your flowerbeds. This is particularly true when using nutrient-rich mulch as opposed to inorganic mulch. If weeds are still a problem, and you don’t want to constantly spot treat them, try placing landscape fabric around your flowerbed and then cover it with mulch. Landscape fabric is impenetrable, preventing weeds or other plants from growing through it. Just a single bare patch will make your lawn look messy and unkempt. In some cases, though, bare patches will correct themselves. Healthy grass adjacent to the voided area will fill it in, creating a more complete appearance. In other cases, you’ll have to reseed the patch. There are a few ways to reseed bare patches, one of which is to apply grass seed and fertilizer by hand. Sprinkle a generous amount over the patch, give it some water, and wait for it to grow in. Alternatively, you can use a lawn patch product that already has a combination of grass seed and fertilizer. Regardless of which one you prefer, go through your lawn and treat bare patches. Ignoring them may result in other patches appearing, which takes a toll on your home’s curb appeal. When was the last time that you tuned up your lawn mower? If it’s been a while, you should perform some basic maintenance to ensure your mower is ready for the spring season. Depending on where you live, you’ll probably need to mow your lawn about once a week. If your mower isn’t properly maintained, you may struggle to keep it running. To tune up your mower, replace the air filter, spark plug and oil. Additionally, you should check the blade to ensure it’s sharp. If the blade is cracked or otherwise dull, replace it with a new blade. You can buy mower blades at most improvement stores for about $10 to $20. A sharp new blade will make a world of difference in the appearance of your lawn. Finally, use this opportunity to prune overgrown trees, plants and shrubs. When pruning, use a pair of sharp gardening shears to cut “rouge” branches and shoots. You don’t have to trim a lot. Rather, trim just enough so that you can reshape it according to your liking. Not only does pruning improve the appearance of trees, plants and shrubs, but it also promotes healthy growth. By removing overgrown branches and shoots, you’ll reduce the nutritional needs of the respective tree, plant or shrub. Therefore, it will grow more easily through spring and into summer. When designing your patio or outdoor living space, you should include a rug for aesthetic and functional purposes. Among other things, it helps to define the space while adding new color and style to the decor. Regardless of your patio’s size, chances are it will benefit from the use of a rug. However, you must choose the right type of rug for your patio. Not all rugs are able to withstand the outdoor environment. When left outdoors for long periods of time, it’s not uncommon for rugs to develop mold and mildew — something that you don’t want to discover on your rug. So, consider the following tips when choosing an outdoor rug for your patio. Vinyl: Also known as polyvinyl chloride (PVC), vinyl rugs are strong, durable and waterproof. Because of these characteristics, they are also easier to maintain than many other rugs, making them an excellent choice for patios and other outdoor living spaces. Polyester: A second material to consider for your outdoor rug is polyester. This synthetic material is inexpensive and readily available. The downside, however, is that it’s not as durable as vinyl or nylon. Assuming your patio receives minimal foot traffic, this may not be a problem. If you use your patio daily, however, you should consider an alternative material for your rug. Nylon: Nylon rugs are an excellent option for outdoor environments. Nylon is a touch, durable and lightweight synthetic material that’s used to make a variety of products, including rugs. Nylon rugs are highly effective at resisting moisture and stains. Furthermore, they are less susceptible to fading when exposed to sunlight, which is one more reason why homeowners prefer using them outdoors. Polypropylene: Finally, polypropylene is a synthetic material that’s frequently used in the construction of outdoor rugs. It’s made of a plastic polymer that’s strong, durable and waterproof. With that said, polypropylene rugs can feel somewhat rough and rugged. Nonetheless, they are still a popular choice for patios and outdoor living spaces. In addition to choosing an outdoor rug made of a waterproof material, you should also consider its size and shape. Outdoor rugs are available in a wide range of shapes and sizes. You can find large 10-foot-by-10-foot rugs, as well as smaller “runner” rugs. So, which size and shape should you choose? It really depends on how your patio is designed. Ideally, the rug should feature a similar size and shape that corresponds with your patio. If your patio has a large open area, perhaps a traditional square-shaped area rug will suffice. On the other hand, if your patio features a smaller rectangular-shaped are, you should consider using a runner rug. Just remember to choose an area rug in a size and shape that’s relative to the surrounding environment in which it’s used. Don’t underestimate the importance of choosing an area rug in the right color. Color can make or break your patio decor. An attractive patio design should feature a cohesive color scheme in which all of the decorative accessories and furnishings flow together in a natural, fluid manner. Outdoor rugs are available in just about every color under the rainbow. Some feature a single color, whereas others feature two or more colors. Ultimately, the color of your rug should flow — not necessarily match — with the rest of your patio decor. Of course, you’ll also need to care for your outdoor rug to preserve its appearance and integrity. While outdoor rugs require less maintenance than most indoor rugs, you’ll still need to clean them on a regular basis; otherwise, they’ll accumulate dirt and debris. Thankfully, cleaning an outdoor rug is relatively easy and straightforward. Assuming it’s made of a waterproof material like nylon or polyester, you can clean it using water, liquid laundry detergent and a scrub brush. First, create a soapy mixture of detergent and warm water. Next, pour a small amount of the rug, after which you can scrub it clean. Place the freshly cleaned rug in an area where it will dry fast, and you’re done! For stubborn stains, you may want to use a fabric cleaner on your outdoor rug. However, it’s a good idea to test any new cleaning product on a discreet area. This way, if it causes additional staining or discoloration, you can stop using it. Help! My Patio Deck is Turning Green! Have you noticed your wooden patio deck turning green. Unfortunately, this is an all-too-common problem experienced by homeowners. It typically doesn’t happen overnight, but months or years of exposure to moisture can turn an otherwise clean patio deck to a yucky green-tinted mess. Not only is a green patio an eye sore, but it can also cause structural damage if left unchecked. So, what causes this phenomenon and how to protect your patio from it? The green stuff that forms of patios is typically either mold, mildew or algae. Although you can’t see it — not without a microscope, at least — wood contains thousands upon thousands of small holes in its surface. These holes, also known as “pores,” are constantly absorbing and releasing moisture, depending on the surrounding environment. When the environment is humid and moist, they absorb moisture. When it’s dry, they release moisture. A wooden patio may turn green when excess moisture is held inside the pores for a long period of time. Mild, mildew and algae thrive in moist conditions such as this. If the wooden patio doesn’t dry out, it may develop a slimy film while simultaneously turning green. There are steps you can take to protect your wooden patio from turning green, however, beginning with increasing the amount of sunlight it receives. Sunlight discourages mold, mildew and algae from growing in several ways. First and foremost, it dries up excess moisture. Secondly, the ultraviolet (UV) rays can destroy many forms of fungi on contact. You can’t necessarily control the direction of the sun, but you can remove overhanging branches or brush that’s obstructing sunlight from reaching your patio. Even if only half of your patio is shaded, that half may turn green while the other doesn’t. The bottom line is that your patio needs direct sunlight to keep mold, mildew and algae at bay. Does water collect and pool up in certain areas of your patio instead of draining off? If so, this could contribute to it turning green. Along with darkness, mold, mildew and algae thrive in moist environments. When water collects on a patio, it creates the ideal environment in which these microorganisms can thrive. Normally, runoff isn’t a problem with traditional wood plank patios. Excess water will flow through the cracks and crevices between the wood planks. There are times, however, when this doesn’t happen. Maybe the wood planks are sealed, or perhaps they were constructed unevenly. Regardless, you need to ensure your patio has proper runoff; otherwise, it may develop mold, mildew and algae. You should also get into the habit of removing any leaves, pine straw and other debris from your patio deck. When yard debris such as this accumulates, it increases the risk of mold, mildew and algae. Again, these microorganisms thrive in moist, dark environments. If there’s leaves covering your patio, the wood planks underneath will remain dark and moist. Whether you use a push broom or leaf blower, clean your patio at least once a week to discourage it from turning green. If your wooden patio deck has already turned green, you can typically restore its color by cleaning off the mold, mildew or algae. Start by pressure washing your patio, beginning with the lowest PSI setting and gradually increasing it until you find a PSI that works. You don’t want to use the highest PSI setting, as this may damage the wooden planks. Once you find a pressure setting that’s strong enough to remove the green slime without damaging the wooden planks, you should be able to clean your patio. The Spruce also recommends cleaning green patios with a homemade solution of vinegar and Borax. After hosing down your patio — either with a pressure washer or garden hose — combine 1/2 cup part distilled white vinegar and 1/2 cup Borax in warm water and place the mixture into a spray bottle. While wearing protective rubber gloves, spray the solution onto your wooden patio, allowing it to sit for five or so minutes. Once soaked into your deck, scrub your deck by hand until it comes clean. What About Concrete Slab Patios? While wooden decks are most susceptible to this phenomenon, concrete slabs can also turn green. Like wood, concrete is also highly porous; thus, offering the perfect breeding grounds for mold, mildew and algae. Protecting a concrete slab patio from turning green requires a similar approach as wooden patios, however. This includes keeping it dry, well-lit with sunlight and ensuring proper runoff. And if your concrete slab patio has turned green, you can clean it by pressure washing it or using the vinegar and Borax solution as described above. Arizona rooms have become a popular renovation project for countless homeowners. While originating in the Copper State from which it receives its namesake, they’ve since made their way throughout the country. So, what is an Arizona room exactly, and how do you create one? An Arizona room is a covered and screened-in outdoor extension of a home that’s typically used for recreational and leisure purposes. They are typically found in the back yard, attached to either the kitchen or living room. Arizona rooms generally follow the same decorative style as the rest of the home to create a cohesive appearance in which all of the colors and accessories flow together naturally. It’s no secret that Arizona is one of the hottest states in which to live. Statistics show that during the summer, temperatures in the Copper State can reach up to 106 degrees Fahrenheit. As a result, many homeowners prefer to relax in Arizona rooms to cool off. The Phoenix-based newspaper The Arizona Republic explains that residents here slept in Arizona rooms during the summer before air conditioning was invented to cool off. The open nature of Arizona rooms combined with the flow of air offers the perfect environment for cooling off. Arizona Room vs Screen Room: What’s the Difference? Some homeowners assume that Arizona rooms are the same screen rooms, but this isn’t necessarily true. While both typically feature a screened-in enclosure, there are some stark differences distinguishing them from each other. Screened rooms usually begin as open patios and back decks that are later converted into screened-in enclosures. They are constructed with different materials than the rest of the home, and they feature a different design. In comparison, Arizona rooms are constructed as extension of the home, with an emphasis on maintaining a cohesive style and decor. Screen rooms are also smaller than their Arizona room counterparts, restricting their usability. Perhaps the biggest difference between a screen room and Arizona room, however, lies in its purpose. As previously stated, Arizona rooms are designed for recreation and leisure. They often feature comfortable seating, stereo speakers, televisions, games and more. Arizona rooms offer several benefits to homeowners and their family members, one of which is the ability to cool off without relying on the home’s central air conditioning unit. According to the U.S. Department of Energy (DOE), heating and cooling accounts for 47% energy usage in the average home. In Arizona, homeowners can expect to pay a premium to keep cool during the blistering-hot summer months. With an Arizona room, however, homeowners and their family members can cool off outdoors. With its covered top and screened-in design, it’s the perfect place to cool off. Of course, an Arizona room is also an excellent place for outdoor living. According to a survey conducted by the American Home Furnishings Alliance (AHFA), 71% of consumers with outdoor living spaces want to enhance these spaces. With an Arizona room, you can easily improve your outdoor living space by adding attractive furniture and furnishings. Since it’s enclosed, you don’t have to worry about weather damaging it. Additionally, Arizona rooms are typically protected against insects. Whether it’s mosquitoes, gnats, bees or flies, insects can force homeowners and family members to seek shelter inside their home. This isn’t a problem with most Arizona rooms, however. Because they feature a fully enclosed environment with mesh screens, there’s a barrier of protection between family members and bugs. Therefore, family members can enjoy this versatile outdoor living space without being bombarded by pesky insects. An Arizona room is also the perfect place to grow container plants. Although it’s typically covered, some sunlight will inevitably shine through. For homeowners looking to grow container plants, an Arizona room is an ideal growing location. If you’re planning to add an Arizona room to your home, you should use an attractive, functional design. Normally, Arizona rooms follow the same or similar design as the rest of the home. This is one of the ways in which Arizona rooms differ from screen rooms. With that said, it’s perfectly fine to use a different design. Install overhead fans to increase airflow and comfort. Choose relaxing furniture like chaise lounges and Adirondack chairs. Use indoor-outdoor rugs to enhance the space’s decor. Don’t clutter furniture near the walls. To recap, an Arizona room is an enclosed, covered extension of a home that’s used for recreational and leisure purposes. They originated more than a century ago in the state of Arizona, where homeowners and family members used them to cool off. Since then, Arizona rooms have become a popular home renovation, not just in Arizona but throughout the entire country. If you want the best looking house in the neighborhood, you need to spend some time cleaning and improving the exterior. While there are plenty of professional service providers out there, there are also projects you can do yourself. Here are the top nine do-it-yourself projects to improve your home’s exterior. Assuming you don’t already have one, create an outdoor living space on your property. According to the Spring Houzz Landscaping Survey, 56% of homeowners plan on improving their yards for entertainment. You can instantly improve the aesthetics and functionality of your home’s exterior by designing an outdoor living space. For instance, this may include a basic lounging area with chairs, benches and a fire pit. When was the last time that you cleaned your gutters? Experts recommend cleaning them between two and four times a year, depending on the surrounding trees. If you have lots of overhanging trees, you should clean them four times a year; otherwise, twice annually should suffice. Failure to clean your gutters will result in the accumulation of leaves and debris on your roof. While this may seem harmless enough, all of that debris can hold moisture can contribute to rot/decay. Cleaning your home’s windows can instantly improve its curb appeal. Over time, windows will attract dirt, mildew and grime. Thankfully, this won’t harm the windows’ structural integrity, but it will leave your home looking dirty. Using a half-and-half combination of hot water and distilled vinegar, thoroughly coat your windows and wipe them down. For tall, hard-to-reach windows, use an squeegee with an extension handle. Don’t just clean the outside of the windows; be sure to clean the inside as well. If you really want to create a comfortable outdoor living space — and enhance your home’s exterior in the process — install a ceiling fan on the patio. Aside from any electrical wiring costs, you can buy a basic ceiling fan for about $50 bucks. Once installed, it will make your patio cooler and more comfortable. And since it’s placed near the front door, a ceiling fan will boost the aesthetics of your home’s exterior, possibly even raising its value. Finishing a wood deck offers several benefits. First, it reinvigorates old, sun-faded decks with new color. Secondly, it protects the deck from mold and decay. There are several different finishes from which to choose, however. If you prefer the current look of your deck but still want protection from mold and decay, you can use a clear finish. On the other hand, if you want to darken your deck with a new color, you can use a stain finish. When staining a deck, the most important thing is to keep it dry and dust-free. If it’s wet, the finish won’t stick. If it’s dusty, imperfections will show. Pressure-washing the siding of your home can make a world of difference in its appearance. Whether the siding is vinyl, brick, stone, synthetic stone, fiber cement, etc., it’s a simple and effective way to improve your home’s exterior. Also known as “power-washing,” it involves the use of a pressurized water to remove stubborn dirt and debris. Painting your home’s exterior may sound a bit too tedious and time consuming. However, you can still improve your home’s exterior by painting just the trim. It’s not uncommon for homes to feature white trim with an alternate color for the siding. Going over the trim with a fresh coat of paint is a simple and inexpensive way to make your home look cleaner and more attractive. If you have damaged or missing shingles on your home’s roof, consider replacing them. Granted, a single missing shingle shouldn’t cause any serious problems. If your roof is missing several, however, water may seep through the roof and into your home. Of course, this can lead to a world of other problems, including mold and structural damage. This is why it’s recommended that you inspect your roof for damaged shingles on a regular basis. And if you discover any, replace them as soon as possible. Finally, updating your patio with new furniture can enhance your home’s exterior. You can check out some of our previous blog posts for outdoor furniture ideas, though some of the most popular choices include teak lounge chairs, Adirondack chairs, benches and wicker furniture. Just remember to stick with a cohesive theme when choosing patio furniture. Following these tips will help you create a more attractive home. Best of all, you can do these projects yourself. So, the next time you’re sitting around the house with nothing to do, head outside to perform one of these projects. Outdoor furniture is available in a wide range of materials, including bamboo, wicker, cast iron, plastic, concrete, wood and more. However, one of the most versatile materials in which outdoor furniture is made is teak. Found throughout Southeast Asia, teak (Tectona grandis) offers some qualities and characteristics that simply aren’t found in other materials. To learn more about teak and why it’s the perfect material for outdoor furniture, keep reading. Teak is a deciduous tree that grows up to 131 feet tall. It has gray and brown branches with green leaves and white flowers. The flowers of the teak tree are believed to be pollinated by insects. A study conducted in 1996 found that Ceratina bees were the main pollinator of teak flowers in Thailand. The wood harvested from the teak tree is brown and red, usually with various spots of darkness and lightness. It’s a hard, porous wood with a density of approximately 720 kg/m3. Teak is also commonly used to make boats. Its buoyant characteristics combined with a natural resistance to mold and rot make it a viable material for constructing boats. So, why should you choose outdoor teak furniture over other types? First and foremost, it offers a premium, high-end style that’s guaranteed to enhance your patio or outdoor living space. As shown above, teak is a clean, structurally intact material that looks amazing. Regardless of your personal style, there’s no denying the innate beauty of genuine teak. It’s the perfect way to upgrade your patio and create a more vibrant, aesthetically pleasing environment. However, the stylish appearance of teak is just one of many reasons why it’s such an excellent choice of material for outdoor furniture. Teak furniture is also long lasting. It’s not uncommon for teak benches, chairs and other furniture to last for 70 years when properly maintained. In comparison, a similar type of furniture made of wicker may only last five to 10 years. If you want furniture that’s going to withstand the hands of time for countless years to come, you can’t go wrong with teak. Granted, plastic and various synthetic materials will also last a long time, but they don’t offer the same stylish appearance as teak. Perhaps the most notable benefit of teak furniture is its natural resistance of mold, mildew and decay. Usually, only synthetic materials are protected against fungi and subsequent rot. Teak, however, is unique because it’s a form of hardwood. Teak wood contains natural oils that allow it to survive in tropical, humid climates. In addition to helping it survive harsh climates, these natural oils protect it from mold, mildew, decay and even certain types of pests. As a result, you can leave teak furniture outside year-round without fear of it becoming damaged. If you plan on buying teak furniture for your patio or outdoor living area, you’ll need to decide whether or not to treat it with a finish. While teak doesn’t rot or otherwise sustain damage when left outdoors for long periods of time, it will fade when exposed to sunlight. Over time, the sun’s ultraviolet (UV) rays will turn its rich brown color to a soft grayish silver. Again, this fading doesn’t affect its strength or structural integrity; it only affects its appearance. Some people prefer the vintage look of naturally aged teak. Others, however, prefer the original color of teak. If you want to keep your teak furniture looking new and protect it from sun fading, you have one of two options from which to choose: you can either store your teak furniture under a covered/shaded area, or your can apply a finish to it. Visit your local home improvement store to find a finish or varnish for your teak furniture. There’s also teak oil that’s designed specifically for teak furniture. Teak oil, however, is not the actual oils contained in teak wood. Instead, it usually consists of linseed oil. When applied to teak, it adds a barrier of protection over the wood, further protecting it from damage as well as sun fading. You can buy teak oil at most furniture stores and home improvement stores. Is your patio prepared for the upcoming winter season? With winter comes cooler temperatures, drier air and the possibility of snowfall, all of which can affect your patio. This doesn’t necessarily mean that you have to stop using your patio for the season. Rather, you should take the necessary steps to “winterize” it beforehand. Doing so will allow you and your family to enjoy this outdoor extension of your home throughout the year. The first step in winterizing a patio is to clean it. Using a broom or leaf blower, remove any lingering leaves, pine straw or branches that have fallen on your patio. Neglecting this otherwise simple step can result in a stained patio deck. Moisture will accumulate in this debris, causing colored compounds to leave onto and into your deck. If you have a grill or fire pit on your patio (or both), you should cover it with a protective tarp. Depending on where you live, you may not receive much rain during this time of year. However, you may still receive some snowfall — and that snow can cause metallic objects like a grill or fire pit to rust. Covering them with a vinyl tarp prevents the intrusion of water while protecting against rust and corrosion. Alternatively, you may want to bring your grill or fire pit indoors for the winter. Bringing a large grill indoors isn’t always feasible, though. 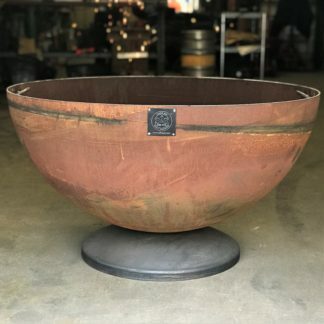 But if you own a small, portable fire pit, you can certainly bring it indoors. Just remember to wait a full 48 hours after lighting it to ensure it’s fully cooled before bringing it inside. You can further protect your patio from damage by staining it with a water repellent product. Most home improvement stores, including Lowe’s and Home Depot, sell a variety of water-repellent stains. You typically apply them just like paint, and once they are finished drying, it creates a waterproof barrier over your patio. Staining a full-sized patio is somewhat tedious and time-consuming, so be prepared to invest a full 1-2 days to this project. When winterizing your patio, you’ll need to take measures to protect your furniture from damage. Generally speaking, the material from which the furniture is made will determine the best method of winterizing it. Here’s a breakdown of some of the most common patio furniture materials and how to winterize them. Plastic: the most “robust” material, plastic furniture requires little maintenance, nor does it need any protection from the winter elements. Wicker: susceptible to damage when left outdoors for long periods of time; bring wicker furniture indoors for the winter. Teak: whether it’s treated or not, furniture made of genuine teak wood is naturally protected against the winter elements thanks to its concentration of water and rot-repellent oils. Aluminum: furniture made of aluminum should either be brought indoors or coated with a layer of automotive wax. Fabrics: unfortunately, fabric furniture is highly susceptible to damage when left outdoors, so bring it indoors for the winter. Patio umbrellas offer an excellent source of shade. Whether they are secured to a table or to the patio deck, it’s a great way to enhance your patio. For the winter, however, you should take down any umbrellas overhanging your patio. If it happens to snow, excess snow may accumulate on the umbrella, causing it to buckle and sustain damage. If you have potted plants on your patio, go ahead and bring them indoors. While different plants are more tolerant to cold weather than others, it’s usually best to err on the side of caution by bringing them all indoors. Placing them in a sunny location next to a large window will ensure they stay warm throughout the winter season. Of course, you may not be able to bring all of your plants indoors. Assuming you have plants growing in the ground near your patio, you should follow some basic precautions to help them survive winter. Adding a layer of mulch around the base of your flowers, plants and trees, for instance, is a simple and effective safeguard for the winter weather. Mulch acts as natural insulation, reducing the loss of heat while subsequently protecting against frost shock. For evergreen plants, consider making a burlap shield. Evergreens are particularly susceptible to cold weather damage, as sub-freezing temperatures prevent the roots from absorbing water. And if they aren’t getting water, they will likely turn brown and die. To prevent this from happening, set up four stakes around your evergreens, securing a burlap screen to the stakes. In addition to keeping your evergreens warm, this also serves as a windbreak, protecting your plants from strong winds. Are you thinking about adding a porch to your home? If so, you’ll need to choose the right type. While all porches are outdoor extensions of a home, there are different types of porches with their own unique characteristics. Also known as a Carolina porch in reference to its popularity in the Southeastern United States, a rain porch is a type of porch with a roof extending beyond the edge of the deck. It’s usually supported with large columns that originate from the ground instead of the porch deck. Rain porches are often preferred because of their strength and durability. The extended roof protects the porch from rain, snow and the elements while also providing a natural source of shade to homeowners and family members. The downside to using a rain porch, however, is that they can be difficult to construct. The columns used for support must be built into the ground, adding another level of difficulty to the construction process. Nonetheless, a rain porch is an excellent porch design for areas prone to bad weather. Rain porches are often seen in historic southern homes. However, they are also seen in Green Revival homes like Rosemount. Also known as a screened-in porch, a screened porch is characterized by a screened enclosure. The walls separating the inside of the porch from the outside consist of a mesh screen material. Because of this design, screened porches offer several noteworthy benefits, including protection from insects and debris as well as privacy. Screened porches can also be used for sleeping when the power goes out. The mesh screen walls allow air to flow through but not insects or debris. So, sleeping on a screened porch can be cooler and more comfortable during the summer if the power goes out. A sleeping porch features similar design characteristics as a screened porch. It typically features mesh screen walls that protect against insects and debris. However, the key difference between a screened porch and sleeping porch is that the latter is more finished. Sleeping porches often feature furniture and decorations. While most sleeping porches feature mesh screen walls, some have actual solid walls instead. 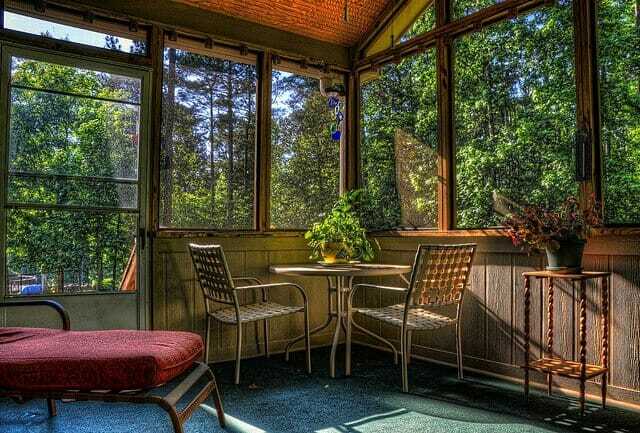 Sleeping porches have origins dating back hundreds of years, during which families would sleep outside to stay cool. Long before air conditioning had been invented, families would use sleep on sleeping porches during the hot summer months. Like a screened porch, the mesh walls allow air to flow through the patio while also keeping the bugs out. Sleeping porches became particularly popular around the turn of the 20th century ago. Back then, it was widely believed that sleeping outdoors would benefit individuals suffering from tuberculosis, as the fresh air would cleanse their respiratory system and subsequently ease some of the symptoms of this potentially deadly disease. A lesser used porch design is the portico. Originating from Ancient Italy, it’s characterized by a tall height and supporting columns or colonnades. Portico porches were often in contemporary Italian architecture, though they’ve since made their way into other architectural styles. Portico porches are often prized for their aesthetics and attention to detail. The large columns add a unique touch to the porch’s style that compliments the home and surrounding landscape. Furthermore, the columns used in its construction are heavy duty, allowing for ample support of the porch roof. There are several different variations of the portico porch, each of which is characterized by the style of columns. The hexastyle, for instance, features six columns, whereas the octastyle features eight columns. There’s also a decastyle, which features 10 columns. The veranda porch design is characterized by a partial enclosure with rails extending in front of the porch and to the sides of the porch. Many houses in the Southern United States feature this type of porch. The veranda porch doesn’t have mesh screen walls, but it still allows for a cool environment thanks to its openness. Additionally, construction is relatively easy and simple. Finally, a sun porch is a type of porch that’s designed to protect against weather. It often resembles an actual room, featuring walls, ceilings and glass windows. Sun porches, however, are designed as an extension to the home and not as part of the home itself. 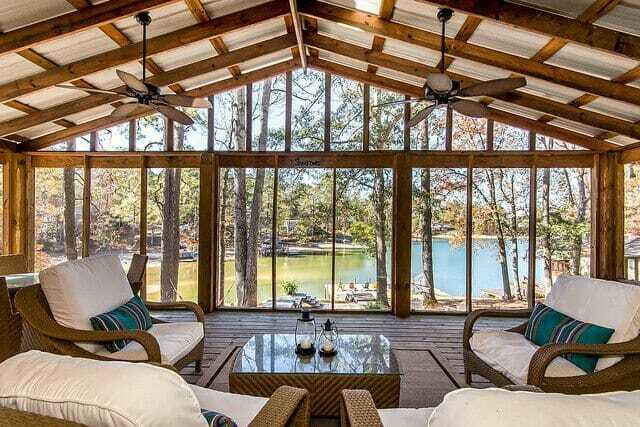 Some sun porches are also designed with glass windows built into the ceiling. Like a sun room, this allows sun to penetrate through and into the porch; thus, promoting thermal warmth while keeping bugs and debris out. These are just a few of the most common types of porches. Of course, some porch designs don’t fall under any of these categories. It’s not uncommon for homeowners to create a custom-designed porch based on their own specifications. A patio offers the perfect area to host parties, barbecues and other outdoor gatherings. Rather than staying cooped up indoors, you can go outside to enjoy the fresh air. But it’s difficult to fully enjoy your patio when it’s exposed to direct sunlight. Without some form of protection, the sun will beat down, creating an uncomfortably hot environment. Thankfully, there are ways to protect your patio from the sun’s glaring light, including the use of a patio cover. An inexpensive and easy-to-install patio cover is lattice. Also known as latticework, it consists of a crossed patterns of wood that offer moderate cover with an emphasis on aesthetics. Some light will still shine through, so it’s not going to completely protect your patio. With that said, some homeowners prefer lattice because of this, as the light helps to illuminate the space without relying on artificial lighting. You can buy lattice at most home improvement and gardening stores, though costs vary depending on the specific material from which it’s made (e.g. wood, metal, etc.). Before investing in lattice, compare prices at multiple stores to determine which one offers the best deal for your patio project. Vinyl patio covers have become increasingly popular in recent years. Made of polyvinyl chloride — the same material used to make PVC piping — it’s strong, durable and able to withstand countless years of use. Like all vinyl materials, vinyl patio covers are completely waterproof and rustproof. So, you don’t have to worry about it succumbing to the elements after just a few months. A disadvantage to using a vinyl patio cover, however, is its lackluster appearance. Many people believe it looks cheap and tacky, so they choose other patio covers instead. Of course, not all vinyl covers look the same; some definitely have a cheap look, whereas others are designed to look more high-end. If you’re worried about the cheap appearance of a vinyl cover, consider choosing one in a dark color. A premium gray or taupe-colored vinyl patio cover won’t look like vinyl at all. A third patio cover option is wood, which is also the most common type. Wood covers offer an unmatched level of aesthetics, enhancing the home’s exterior decor while creating a more attractive patio in the process. Wood covers can also be painted and finished in just about any color, giving homeowners such as yourself more freedom over customization. But wood is also susceptible to rot and decay. Unless it’s treated with a water-resistant finish, wood covers may rot away due to moisture exposure. Water particles seep into the wood’s pores, at which point they encourage the growth of mold and mildew. This, in turn, causes the wood to slowly decay — and that’s not particularly safe when it’s hanging over your patio. You can still use a wood patio cover, but make sure it’s coated with a water-resistant finish to prevent this from happening. Metal is a popular alternative to wood patio covers, with the most common metal used for this purpose being aluminum. It’s strong, lightweight, doesn’t rot and highly effective at reflecting heat away from your patio. Unfortunately, aluminum patio covers can become damaged due to falling debris. This isn’t limited strictly to aluminum, however; all patio covers can sustain damage from falling tree limbs. But aluminum is particularly prone to such damage because of its thin, lightweight construction. The bottom line is that if you’re going to choose an aluminum patio cover, make sure there are no overhanging tree limbs. Another patio cover option is cloth. Typically made of a fabric blend containing both natural and synthetic materials, cloth covers are easy to install and look great over all patios. They are available in countless colors and styles to match your home’s exterior. A benefit of cloth patio covers that’s not found elsewhere is the ability for them to retract. Granted, some cloth covers are fixed and stationary, meaning you can’t move them (not easily, at least). Others, however, are installed with a retractable device. If it’s warm and sunny outside and you want to get a tan, you can retract the cloth cover. But if you want to read a book without the sun glaring in your face, you can pull it back out. If installing a patio cover sounds too difficult or expensive, you can always use an umbrella as a quick solution. There are free-standing patio umbrellas available as well as table-mounted umbrellas. Once installed, it creates a small but effective area of shade while enhancing your patio decor in the process. As you can expect, an umbrella isn’t going to offer the same protection as an actual patio cover offers. The good news is that umbrellas are easy to set up, and they cost a fraction of the price of an actual cover. A wood deck is the perfect outdoor extension to your home. When the weather is mild, you can go outdoors to enjoy the sunshine and fresh air. First and foremost, you should get into the habit of removing leaves, pine straw, tree branches and other fallen debris from your wood deck. Allowing debris such as this to accumulate can cause discoloration while also promoting mold and mildew. Using either a push broom or a leaf flower, try to get into the habit of cleaning your wood deck on a regular basis. When grilling on your wood deck, use a grease catcher to collect the grease. Not all grilled foods produce grease. If you cook vegetables, fish or even chicken, you’ll probably have little-to-no grease. Red meat, on the other hand, produces a fair amount of grease, which can cause stubborn stains when dripped onto a wood deck. Using a grease catcher with your grill, however, will protect your wood deck from such stains. If you live in a region that’s prone to snow, be sure to shovel it off your deck. There are several problems associated with a snow-covered deck: it saturates the wood with moisture, contains dirt and debris that may stain the deck, and it prevents you from fully using or otherwise enjoying your deck. Shoveling show isn’t particularly fun, but it’s a necessary step in maintaining a wood deck if you live in a region that’s prone to snow. So, after the winter storm has passed, take a few minutes to shovel the snow off your deck. Assuming you have a fire pit on your wood deck, you should place some type of fireproof material between it and your deck. Normally, a fire pit shouldn’t cause a wood deck to ignite. It can, however, scorch the bottom if placed directly on it. There are several solutions to protect your wood deck from such damage. You can create a fireproof area on which to place your fire pit using brick pavers, or you can buy a special “fire pit pad.” Either way, you need some type of material or substrate underneath your fire pit to protect your deck. When was the last time that you inspected your wood deck for rotten planks? Regardless of species or variety, all types of natural wood are susceptible to rot. Wood contains thousands of small pores that constantly absorb or release moisture. When your wood deck is exposed to moisture — even small amounts of airborne moisture (humidity) — it may cause it to rot. The good news is that a few rotten planks can easily be replaced without demolishing and rebuilding your entire deck. To do so, however, you’ll need to inspect your wood deck regularly; otherwise, rotten planks may go unnoticed. You can only do so much when using a garden hose to clean a wood deck, which is why it’s a good idea to pull out the pressure washer on occasion. With your pressure washer set to 600 to 800 psi, you can revitalize the appearance of your wood deck. The pressurized water will easily remove stubborn dirt, mold, mildew and grime. Even if you don’t own a pressure washer, you can still rent one from your local home improvement store. Home Depot and Lowes both rent out pressure washers for about $35 bucks per day, which is a small price to pay considering the convenience and cleaning power it offers. Just remember to wear the appropriate safety goggles, and to keep the nozzle at least six inches away from the surface of your deck at all times. Perhaps the most important tip to protect a wood deck is to seal it. Sealing your deck prevents the intrusion of moisture, which as stated above, can lead to rotten planks. Furthermore, some wood sealers are designed with special UV-protectant ingredients, adding another level of protection for your deck. In addition to protecting against water, these sealers also protect against the sun ultraviolet (UV) light. There are dozens of different wood sealers available for sale, so choose the one that’s best suited for your deck. You can also check out this article by Lowes for step-by-step instructions on how to seal a wood deck. Finally, use caution to avoid accidentally trapping dirt and moisture in your dirt. If you have furniture on your deck, for instance, move and clean underneath it regularly. If a table or flower pot is left in the same place for months on end, it will probably accumulate moisture underneath. And too much moisture can damage your deck by promoting rot and mildew. Following these tips will help to protect and preserve your wood deck. The Adirondack chair consistently ranks as one of the most popular types of outdoor chairs. Also known as a Muskoka chair in Canada, it offers the perfect blend of style and comfort, with an emphasis on the latter. But what exactly is an Adirondack chair, and what should you look for when buying one? The Adirondack chair receives its namesake from the Adirondack Mountains. Located in northeast New York with a peak elevation of 5,344 feet, the Adirondack Mountains have been a popular tourist destination for over a century. Within the mountain’s ecosystem are swamps, marshes, bogs and rolling hills of glacier-carved rocks. Statistics show that roughly 60% of the Adirondack Mountains are covered with hardwood forest, making it a prime habitat for birds like the great blue heron, gray jays, boreal chickadees, crossbills and more. Some people assume the Adirondack chair is a relatively new invention, but this isn’t the case. The Adirondack chair has origins dating back to 1903, during which amateur American inventor and amateur woodworker Thomas Lee created the first prototype. According to various reports, Lee was vacationing with his family in the Adirondack Mountains in 1903 when he encountered a problem: a lack of seating. With some family members being forced to stand, Lee sought to find a solution, which led him to designing his own chair. Lee soon discovered, however, that traditional chairs didn’t fare well on the mountainous terrain of the Adirondacks. Because the land was sloped instead of flat and even, chairs were either tilted forwards or tilted backwards, resulting in discomfort and poor balance. Until now, there wasn’t a solution for the uneven terrain. So, Lee began to design his own chair with a focus on making it comfortable and balanced when placed on uneven terrain. After countless hours of hard work, Lee developed a chair with an angled seat and angled back (see image above). Both the seat and back sloped back to accommodate the uneven terrain of the Adirondack mountains. With a 25 to 35-degree back slope, the chair could be placed on an uneven terrain to create a more balanced and stable seating area. This later became known as the Adirondack chair. You might be surprised to learn, however, that Lee didn’t receive full credit for his work. After creating the first prototype, Lee took the chair to a carpenter in upstate New York named Harry Bunnell. Lee asked Bunnell to recreated the chair for him. But Bunnell went behind Lee’s back to file a patent for the chair, calling it the Westport Chair. Bunnell even received a patent for the Westport Chair, which Lee didn’t contest. But while Bunnell ultimately won a patent for the chair’s design, most people today recognize the mountainous chair as being the Adirondack chair. With its unique design, the Adirondack chair offers several noteworthy benefits. First and foremost, it’s important to remember that the Adirondack chair was specifically made for uneven terrain. So, if you’re looking to invest in new seating for an outdoor living space on a sloped hill, there’s no better choice than the Adirondack chair. With its sloped seat and back, it offers a superior level of comfort and stability. Regardless of whether it’s placed on a flat or sloped surface, however, the Adirondack chair is arguably one of the most comfortable outdoor seating options on the market. Today, most Adirondack chairs feature an adjustable back, and some even have adjustable armrests. Therefore, you can easily adjust the Adirondack chair for optimal comfort on a flat surface as well. Another benefit of the Adirondack chair is its ability to minimize stress on the back. The American Chiropractic Association (ACA) reports that nearly eight in 10 Americans will experience back pain at some point during their life. With its angled design, however, the Adirondack chair eases pressure on the spine while subsequently reducing the risk of pain back and other related problems. When choosing an Adirondack chair for your patio or outdoor living space, there are several things to consider. First and foremost, check to see what material it is made of. Lee’s original design was made of natural hardwood sources from the surrounding Adirondack Mountains. Today, however, you can find Adirondack chairs made of a variety of materials, including beech, ash, oak, maple, teak and plastic. Hardwood materials typically offer the highest level of quality, though they also come at a premium price. You should also consider the color of the Adirondack chair and whether or not it matches the outdoor decor where it will be used. Ideally, the color should match or otherwise flow cohesively with the rest of your decor. Of course, the Adirondack chair is just one of many seating options to consider. But with its unique angled design, it’s the perfect choice for sloped landscapes. And just like that winter was gone — well, almost at least. The official start of spring is just one month away, which means more and more homeowners will be going outdoors to enjoy their patios. To fully enjoy this extension of your home, however, you’ll need to prepare it for spring. First and foremost, you’ll want to clean your patio, sweeping away any pine straw, leaves or other debris. Not only is this an eye-sore, but yard debris can leave permanent stains on wooden patio decks. After removing the debris, wash it with a deck cleaning solution to achieve an even cleaner appearance. With a clean patio, you can begin decorating and preparing it for use this spring. The upcoming spring season offers the perfect opportunity for homeowners to host outdoor parties. Whether it’s cool weather with a few close friends or a full-blown party, a few grilled burgers, beverages, and activities, a fire pit will make your patio a little more enjoyable for these and other outdoor social gatherings. It’s difficult to enjoy a patio without seating and furniture. But not all furniture is suitable for use on a patio, which is why it’s important to choose the right type. Stick with furniture that’s waterproof and able to withstand the spring showers. Cushions for chairs and other seating should also be made of a waterproof material. Or if you choose a non-waterproof material for your seat cushions, be sure to bring inside at the end of the day. The early spring season offers the perfect opportunity for homeowners to decorate their patios with planters. Even if you have little-to-no gardening experience, you still pick up some low-maintenance plants from your local nursery or home improvement store, using them to enhance your patio decor. A few colorful planters will transform an otherwise generic patio into a vibrant outdoor living area. Consider the lighting on your patio and how it impacts both the mood and function of the environment. Depending on which side your patio is facing, it may receive sunlight during the day, in which case additional lighting isn’t needed. But even if the sun illimuminates your patio during the day, you’ll still need an additional light source during the evenings and nights. Tiki torches, string lights, post lights, LED rope lights and wall sconces are all excellent lighting options to consider. Campfires have been around since the early days of mankind. A recent analysis of antelope bones discovered in South African caves suggests that humans have build controlled fires some 1.6 million years ago. While we now have tools like lighters and matches to ignite campfires, we still build them for the same purposes: warmth, cooking, light, and social enjoyment. There are several ways to build a campfire, however, which we’re going to explore today. One of the most common types of campfires is the tipi, which lives up to its namesake by featuring the shape of a tipi. To build a tipi campfire, you’ll need to arrange some of small kindling vertically around the center. If the kindling isn’t staying up on its own, you can lash some sticks together for additional support. Next, place the larger kindling above the small kindling, using caution not to collapse the arrangement. Tipi campfires such as this are great for producing warmth. When you add more firewood to it, heat from the bottom rises to the top; thus, igniting the newly added firewood. The only real downside is that firewood in a tipi can become unstable as it burns, resulting in the tipi falling over. An alternative to the tipi campfire is a lean-to. This type of campfire follows a similar approach as the tipi, using the same large and small kindling arranged vertically. However, it differs in the sense that a thick piece of kindling is staked into the ground diagonally so it overhands the pile of kindling. A variation of the lean-to consists of a large piece of firewood placed on the ground next to the tinder. The kindling is then placed next to this firewood, with one end propped up and the other end sitting on the ground. This allows the kindling to lean over the tinder; thus, serving as a windbreak. A third type of campfire and in my opinion the best is the log cabin. To create a log cabin campfire, gather and place a pile of tinder in the center and stack kindling around it. When placing the kindling, lay the first two sticks parallel to each other on opposite-facing sides. The next two sticks of kindling should be placed horizontally on top of the first pair. You can then repeat the process by adding more kindling, also placed horizontally on top of the previous pair. The primarily benefits of a log cabin campfire is its structural stability and air flow. It’s the most structurally sound, reducing the risk of collapse and you get a nice bed of coals once the cabin is burned down. With roots dating back to the 1960s, artificial grass (also known as artificial turf) has been a viable alternative to traditional grass. It’s made of synthetic fibers that mimic the look and feel of natural grass. Back then, however, it was used primarily in athletic fields. It wasn’t until the 1990s when artificial grass become a popular choice in residential lawns. But if you’re thinking of installing it in your lawn, you should weight all of the pros and cons. Unlike natural grass, artificial grass isn’t susceptible to pests. The synthetic fibers are naturally pest-resistant, meaning you don’t have to worry about applying and reapplying pesticide to your lawn. While the exact cost of installation varies, homeowners can expect to pay more for artificial grass than natural grass. With natural grass, you can simply spread a combination of seed and fertilizer, allowing Mother Nature to do the rest. Artificial grass costs a bit more to install, as homeowners must pay for the turf itself, as well as labor. 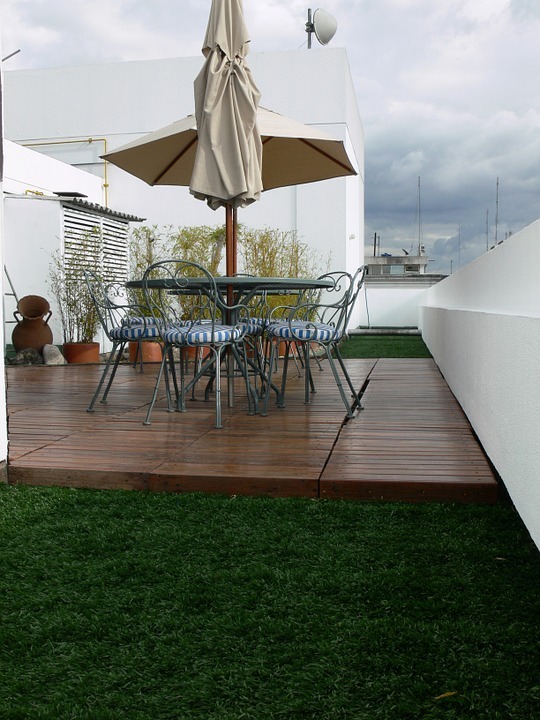 Artificial grass is also resistant to erosion, more so than natural grass. Heavy storms and subsequent rain runoff can wash away natural grass, eroding the soil and changing the landscape. This typically doesn’t happen with artificial grass, however. The synthetic material is strong, durable and resistant to erosion caused by runoff. If you play on your lawn with your children, you should think twice before investing in artificial grass. According to a study conducted by Brigham Young University, the surface temperature on artificial grass is roughly 37 degrees higher than the temperature of the surrounding air. This is because the synthetic materials from which artificial grass is made holds heat; thus, it’s warmer than natural grass. Conventional wisdom should tell you that artificial lawns saves water. Unlike their natural counterpart, artificial grass does not need regular watering. When a heat wave blankets your area next summer, you can rest assured knowing that your lawn is safe, with or without water. This alone is reason enough for many homeowners to choose artificial grass for their lawns. Synthetic grass doesn’t grow, and as such, you don’t have to mow it. Once installed, it stays the same height throughout the year. Winter is in the air, with homeowners from the east coast to west experiencing sub-freezing temperatures. When the mercury drops below 32 degrees Fahrenheit, though, water turns to ice — and this ice can prove downright dangerous when it forms on your patio and deck. So, how do you prevent your deck from freezing? 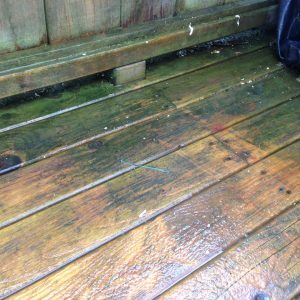 Cleaning a wooden deck isn’t going to necessarily prevent it from freezing, but it can certainly help by discouraging mold and mildew, which can make your deck more slippery if left unchecked. Mold and mildew need organic matter to thrive. So things like dust, pine straw, leaves and other organic debris provide ideal breeding grounds. You can discourage mold and mildew from forming on your wooden deck, however, by cleaning it on a regular basis. Even after removing the debris from your wooden deck, you should still apply a proper deck-cleaning product. Available at most home improvement stores, these products contain special chemicals to further eliminate microbial growth without harming the deck’s wooden structure. Some homeowner prefer to make their own deck-cleaning solution — and that’s okay. Just remember to avoid using products ammonia AND bleach, as this creates a dangerous and toxic chemical when mixed together. After applying deck-cleaning product and allowing it to set, you should apply a water-repellent stain. These stains are specifically designs to repel water, and without water settling on your deck, it shouldn’t freeze. While steps for applying a water-repellent stain vary depending on the product, most require brushing or rolling the stain onto the wooden boards, preferably on a day with minimal sunlight (sunlight causes the product to evaporate and oxidize more quickly. Wait at least 48 hours for the stain to settle, at which point your wooden deck should be protected from moisture and ice. If you live in a region that receives particularly cold winters, you may want to install some self-adhesive non-slip strips to your deck. This isn’t going to prevent it from freezing. Rather, it improves traction while preventing slip-and-fall accidents. You can buy them for less than $10 bucks, which is a small price to pay for the added safety they offer. Place them in high-traffic areas such as steps and in front of doors. Outdoor living has become one of the hottest home design trends. But if you want to enjoy your outdoor living space to its full potential, you should make it fun and entertaining. Going back to the basics of home decor 101, all gathering spaces should include a central focal point — and outdoor living spaces are no exceptions. While the TV or fireplace is often used as a focal point indoors, you may not have the option of using either of these in your outdoor living space. An alternative focal point that works just as well, however, is a fire pit. Space is paramount when designing a functional and entertaining outdoor living space. If the space is crowded with little-to-no space for guests to move around, you won’t be able to enjoy this area. Many experts recommend following the “less is more” rule when designing outdoor living spaces, meaning you should include just a few pieces of furniture here. When was the last time that you actually cleaned your outdoor furniture? Being that it’s outdoors, many homeowners are guilty of rarely, if ever, cleaning their outdoor furniture. So when guests come over, they are forced to sit on dirty and damp seat cushions. Keep your outdoor furniture clean and free of debris to prevent this from happening. Don’t underestimate the importance of maintaining a well-manicured lawn. It’s difficult to enjoy an outdoor living space when there’s overgrown weeds and tall grass blanketing the lawn. Giving your lawn a little attention will go a long ways in enhancing your outdoor living space. You should also include an area where guests can place their drinks and food. Outdoor tables with built-in umbrellas work well, although you can also choose smaller side tables. Some chairs also feature drink holders. Not all furniture is suitable for use outdoors. Even if the area is covered, moisture vapor in the air can damage furniture made with cotton and similar organic fabrics. This is why you should stick waterproof furniture that’s designed specifically for the outdoors. Furniture made with synthetic materials like polyester are typically better suited for the harsh outdoor environments, making them ideal for this purpose. Does your outdoor living space feel cluttered and confined? It’s difficult to fully enjoy this extension of your home when it’s cluttered. If this sounds familiar, read the following tips to improve your outdoor living space. Don’t make the mistake of leaving your tools out. Not only will this clutter your outdoor living space, but it may also cause them to rust. After using your tools, store them in a covered area such as a garage or shed. Sure, it takes a little more time, but you’ll reap the benefits of longer-lasting tools and a cleaner, less-cluttered outdoor living space. Another helpful tip to de-clutter your outdoor living space is to keep a trash can nearby. You’ll probably come across a fair amount of trash and debris when doing yard work. With a conveniently located trash can nearby, you can dispose of these items more easily. Placing the garden hose inside a rustic tin bucket. Installing a holder on the side of your house. Hiding it inside of a large fake rock (some are made specifically for garden hoses). Overhanging and encroaching branches can also lead to clutter. This is why it’s a good idea to get into the habit of trimming overhanging branches on a regular basis. If a nearby tree is slowly growing its branches onto your outdoor living space, trim them back so it doesn’t hurt the decor and/or function of the space. Assuming you have a fire pit (and you should), try to keep all of its related accessories together. Maybe you have a stack of firewood, grate brush and heat-resistant pad, in which case you should store them together. Fire pit accessories such as these can be placed inside of a large deck box, or you can simply use an aluminum container. It takes more than just a few plastic chairs and a table to create an attractive outdoor living space. If you want to truly enjoy your home’s outdoor area, you should design it with inviting elements. Only then will it set the tone for a pleasing environment. Here are a few quick and easy ways to make your home’s outdoor living space more welcoming. One of the easiest ways to make your outdoor living space more welcoming is to add potted plants and flowers. Even if you have limited experience as a “green thumb,” you shouldn’t have any problem growing three or four small plants in potted containers. For an added touch of style, top the containers off with small pebbles covering the dirt. This adds a unique and stylish look, while also helping the water evenly disperse. Allowing weeds to encroach upon your sidewalk doesn’t exactly provide a welcoming and inviting atmosphere. This is why homeowners should maintain clear, obstruction-free walkways leading to their outdoor living space. While weed-killing sprays and products sold at home improvement stores can eliminate stubborn weeds, but another solution is to create your own weed killer using vinegar, table salt and a liquid dish soap. Spray this solution around your sidewalk and other walkways to kill weeds and prevent unwanted growth. Try painting the trim around your doors and windows to enhance the look of your outdoor living space. Assuming you have other furniture here, you can even use a similar color to achieve a cohesive theme. Rugs aren’t used strictly indoors; they can also be used outdoors. If you want to make your outdoor living space look more welcoming, place a decorative outdoor rug here. Just remember to choose a rug that’s made of a durable synthetic material. Traditional 100% wool rugs won’t hold up in the outdoor elements. There’s a reason why fire pits consistently rank as one of the most popular additions to outdoor living spaces: they offer both functional and aesthetic benefits. Adding a fire pit to your outdoor living space will create a natural focal point while making the area look more inviting. It also provides functional benefits, allowing you to grill steaks, roast marshmallows, and comfortably enjoy the otherwise cold fall and winter evenings. No patio is complete without comfortable and aesthetically pleasing furniture. The right furniture will enhance your patio, allowing you and your family to enjoy this extension of your home just a little more. Wicker is always an excellent choice of outdoor furniture for the patio. Made from all-natural twigs (e.g. rattan, reed or bamboo) that are woven together, it offers a truly one-of-a-kind look that’s not found elsewhere. When used with a cushioned padding, wicker furniture is ultra comfortable. Another benefit of wicker furniture is its weight. Being that it’s made of twigs instead of heavy metal, it weighs significantly less than other types of outdoor furniture. As such, you can easily move it from one end of your patio or landscape to the other, without requiring a second set of hands. Another option for patio furniture is plastic. It’s typically the cheapest, making it a great choice for budget-conscious homeowners. You can buy a full set of plastic patio furniture for well under $100 bucks. Plastic furniture is completely waterproof, meaning you don’t have to worry about it developing rust or mold. You can leave it uncovered for months outdoors without damage. Of course, hardwood is a third type of outdoor furniture that’s suitable for the patio. Certain types of finishes and coating can protect hardwood furniture from moisture damage, but it’s generally still not “waterproof.” So if you’re going to invest in hardwood furniture, it’s generally best to keep it covered. How many chairs/seating do I need? If you plan on hosting parties, you should buy enough patio furniture to accommodate all of your guests. What color scheme do I want? Unless you’re going for an eclectic look, you should stick with a general color scheme on your patio. How will the furniture affect the appearance of my home? Your choice of outdoor furniture can and will affect the appearance of your home. Choose furniture that compliments and flows cohesively with your home’s exterior. Is the furniture resistant to water? Again, you generally want outdoor furniture to have at least some water-resistant properties. What’s my budget? As with most home improvement projects, you should set a budget for your outdoor patio furniture.